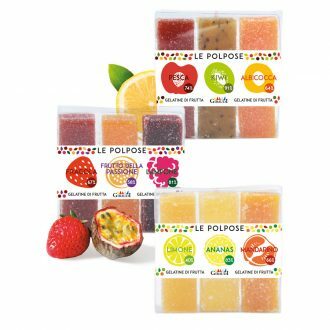 Fruit Jellies with a high percentage of fruit . Peach, Kiwi and Apricot. Peach: Peach pulp (peach, sugar, antioxidant: ascorbic acid) 69%, cane sugar, glucose syrup, inverted sugar, gelling agent: apple pectin, lemon juice, natural flavor. Coating: cane sugar. 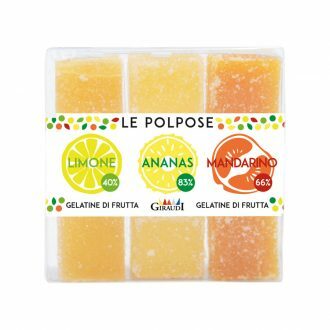 74g of fruit pulp per 100g of fruit paste. Kiwi: Kiwi pulp, cane sugar, glucose syrup, gelling agent: apple pectin, lemon juice, natural flavor. Coating: cane sugar. 91g of fruit pulp per 100g of fruit paste. Apricot: Apricot pulp ( apricot, sugar, antioxidant: ascorbic acid) 60%,cane sugar, glucose syrup, inverted sugar, gelling agent: apple pectin, lemon juice, natural flavor. Coating: cane sugar. 64 g of fruit pulp per 100g of fruit paste.